One of the most exciting young mandolinists in the country, Chris first gained attention with Nickel Creek, his acoustic band, which plays an amalgam of bluegrass, Celtic, pop, and jazz styles. 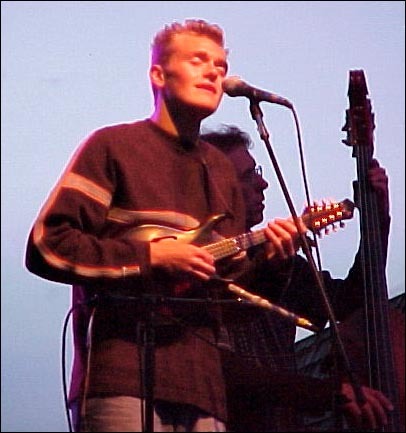 In his mid-20s or so, he is widely renowned for his playing and composing; has a stack of solo albums and session work to his credit; and served a stint in the Modern Mandolin Quartet. His primary mandolin is an F-style built by Lynn Dudenbostel, on which he sometimes uses a Schertler pickup. But in other situations that call for him to plug in, he has used this Rigel instrument. Astute observers will note that this Rigel differs from the standard G110 model in that the treble-side horn is shortened to allow for easier access to the upper reaches of the fingerboard. (This may not be important to you, but it is to Chris.) Rigel designed a production model, the CT110, which incorporated this feature and not coincidentally was named after Chris.